Federal officials have proposed a Federal Acquisition Regulation rule to set up a one-stop Internet gateway to information on procurements worth more than $25,000. 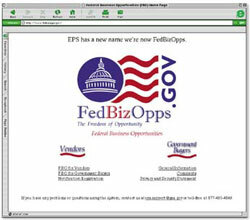 The FedBizOpps site, at www.fedbizopps.gov, was formerly known as the Electronic Posting System. The FAR Council published the proposed rule last month in the Federal Register. 'The site currently provides access to presolicitation notices, solicitations and other procurement information for contracts at 18 agencies. Under the rule, other agencies would have until Oct. 1, 2001, to begin posting comparable information on FedBizOpps. The General Services Administration will accept comments until Oct. 31. Comments can be sent via e-mail to farcase.1997-304@gsa.gov.